Tornadoes rolled in from the prairie and slammed Oklahoma City and its suburbs, trapping people in their vehicles as a storm swept down an interstate highway while commuters tried to beat it home. Five people were killed, including a mother and baby killed near Union City. Another person died at El Reno, the first city struck by the storm, said Amy Elliott, a spokeswoman for the state medical examiner. Circumstances involving the other two deaths weren't immediately known, Elliott said. About 50 people were hurt, five critically, hospital officials said. Meteorologists had warned about particularly nasty weather Friday but said the storm's fury didn't match that of a deadly twister that struck suburban Moore last week. Violent weather also moved through the St. Louis area, ripping part of the roof off a suburban casino. Friday's broad storm in Oklahoma hit during the evening rush hour and stuck around, causing havoc on Interstate 40, a major artery connecting suburbs east and west of the city, and dropping so much rain on the area that streets were flooded to a depth of 4 feet. Rick Smith, the warning coordination meteorologist for the National Weather Service at Norman, said that while the storm packed a powerful punch, it wasn't as strong as the Moore tornado. "This storm had everything you could handle at one time: tornadoes, hail, lightning, heavy rain, people clogging the highways," Smith said. "It's not even close to anything like what we had last week," Smith said. "We were very concerned this would move into downtown. It would have been a major problem. It made all the difference that it was out in the country." The U.S. averages more than 1,200 tornadoes a year and most are relatively small. Of the 60 EF5 tornadoes to hit since 1950, Oklahoma and Alabama have been hit the most -- seven times each. 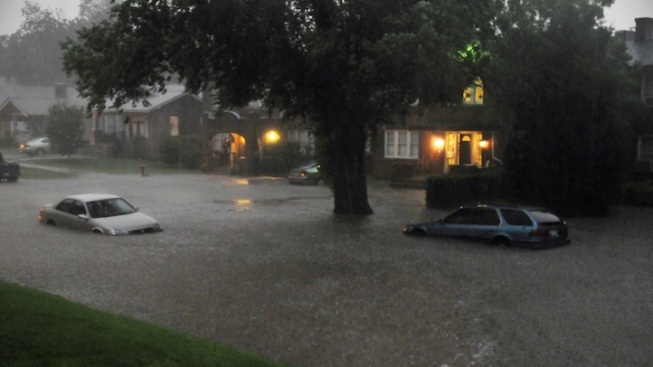 Heavy rain and hail hampered rescue efforts in Oklahoma City. Frequent lightning roiled the skies well after the main threat had moved east. Highways and streets were clogged late into the night as motorists worked their way around flooded portions of the city. Will Rogers World Airport said flights wouldn't resume until morning, after debris was cleared from runways. The storm picked up and threw a Weather Channel Tornado Hunt chase vehicle. The Hunt Team is safe but has minor injuries, the Weather Channel reported. At Will Rogers, passengers were directed into underground tunnels as the storm passed just north of the airfield. However, people near the area said they weren't aware of any damage. Associated Press writers Ken Miller and Tim Talley in Oklahoma City, Justin Juozapavicius in Tulsa; Jeannie Nuss in Texarkana, Texas; and Jim Salter in Maryland Heights, Mo. ; and freelance photographer Nick Oxfrod in Oklahoma City contributed to this report.